Havertz: the future of German football? Lauded in Germany as the future of the national team, Kai Havertz has burst on to the scene for Bayer Leverkusen in stunning fashion over the past 12 months. Representing his country at every youth level, Havertz is hopeful that continued success for club is likely to reward the youngster with an opportunity to represent the German full national team. For those who have been in the game for some time, the idea that players born in or around 2000 are now professional footballers can shock and surprise. 18-year-old Havertz, born in 1999, has already had a year of regular first team football for Bayer Leverkusen and the Aachen-born youngster is confident that will continue for forseeable future. 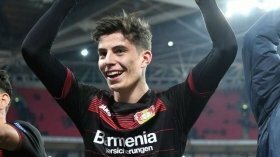 Havertz, who has been with Leverkusen since the age of 11, has caught the eye of numerous clubs across Europe including Premier League trio Arsenal, Chelsea and Man Utd. It is understandable that the Gunners have been monitoring Havertz's progress, as the player has drawn comparisons with his compatriot Mesut Ozil recently. Havertz can operate as a central midfielder or an attacker but is most confident in an advanced central midfield role, from where he can perform his creative duties. An accomplished passer of the ball and intelligent reader of the game, Havertz despite his tender age looks like he could be a professional of decades. This year Leverkusen are sitting in a mid-table position but for many this is a season of transition for the club. With fellow youngsters Jonathan Tah, Kevin Volland and Atakan Akkaynak all set to lead the club for the next five years, Leverkusen are hoping it's current crop of youngsters will be capable of competing with Bayern Munich in future seasons. For Leverkusen, Havertz will be key to a lot of their future success.